John F. Campbell was born about 1838 in North Carolina. 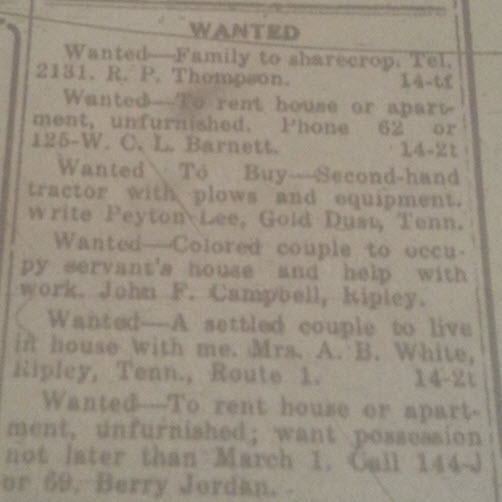 On the 1910 census John and his wife Mary are living in Ripley and John is working in the grocery business, but there does not appear to be an African American couple living with them. They do have African American neighbors, but the male neighbor is a teacher and the female neighbor does not have a job listed. On the 1920 census he is listed as widowed and boarding in someone else’s home, so there doesn’t appear to be a clear paper trail to determining if an African American couple answered his ad or ever lived with him.